Walking, Dancing, Singing, and Sharing! Our teachers are excited to see our infants now walking, or as we say waddling. It’s so exciting to watch how an 18-month old child uses objects to act out familiar activities like eating, drinking, and telephoning. This special program allows our waddlers to explore, walk, and use different kinds of play things. screeching when you pop into the Waddler Room! In the Waddler Room, in addition to learning how to walk, your child will also learn how to use spoons, forks and sippy cups. 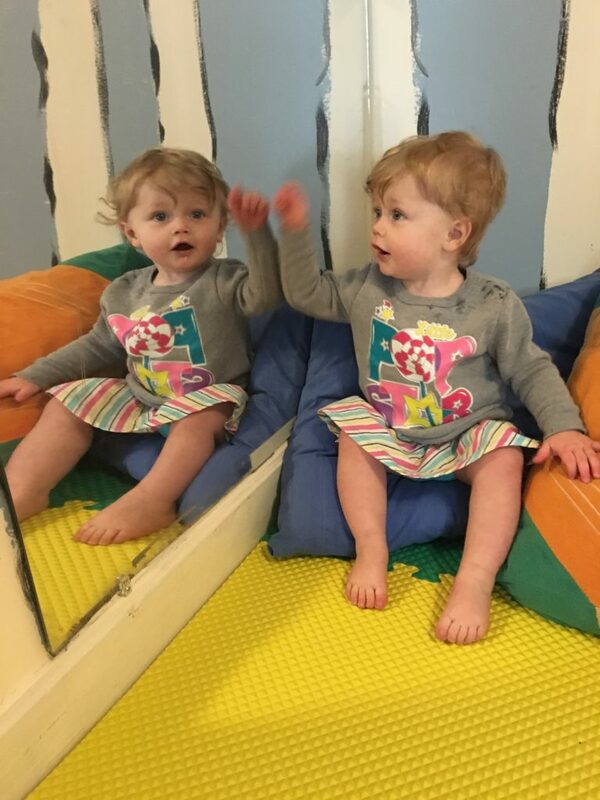 We help parents with all of the major transitions ahead as they are sure to see a large increase in motor-skills and language development during their child’s time in the Waddler Room. Due to this age group’s tendency to develop stranger anxiety, we intentionally ask other teachers in the center to stop by throughout the day and help in the room. Your child will learn every face at the center, making their transition into future programs very smooth. Also, children entering this room are about to begin to understand the concept of sharing, so we highly encourage developing the ability to pass items back and forth, as well as provide a large variety of toys to ensure each child can play independently.